I had promised last week that my next post would be about the Third Postage Due Issue of 1933-1935. However, shortly after I published my post last week about the Second Postage Due Issue, a regular reader pointed out that I never wrote about the First Postage Due Issue. Surprised, I went back over my posts and realized that he was indeed correct. So I figured that this week, I had better circle back and write about this very beautiful and simple early modern issue. Like the other Postage Due material, it is not nearly as popular with collectors as it ought to be, most likely because of where it is located in people's albums. My hope is that this post will demonstrate that this is a fantastic candidate for a specialized collection, as it offers so many opportunities for the specialist, while at the same time featuring some very scarce material. One of the factors that makes it so interesting is its long period of use: 25 years, from mid 1906 until 1930, when the Second Issue replaced it. Because of this it exhibits all the variations that resulted from the technical innovations of the time, such as the switch from wet to dry printings, the use of the experimental "thin" paper in 1924, the use of lathework, and finally a large range of different shades. On this last point, Unitrade's colour names of violet and reddish violet are somewhat misleading, as most of the shades are really blackish purples and blackish lilacs. This issue was printed by the American Bank Note Company of Ottawa (ABN), in sheets of 400, which were split into post office panes of 100. Replaced in 1930 (exact date unknown). From the issue quantities above, it seems as though some of the prices listed in Unitirade make little sense. For example, after the 10c, which is clearly a very scarce stamp - on a par with the Bluenose, or any of the dollar values from the 1920's & 1930's, the next most expensive stamp is the 4c. This is strange, considering that the quantity printed of the 5c is less than the 4c. The 1c is nearly as scarce as the 4c also, but nowhere near as expensive. In fact, the quantities above are the combined total of all printings made and issued over the life of the set, which is significant, because the 4c and 10c were issued towards the end of the life of the set, whereas the other values were printed, many, many times. What this means is that it is very likely that virtually any single printing of the 1c, 2c, or 5c is quite likely to be scarcer in absolute terms, than the 4c, and yet, the catalogue prices do not reflect this at all. 3. Wet and dry printings. 4. Plate blocks and other multiples. 5. Lathework and lathework pieces. 8. Pyramid guide blocks and R-Gauge blocks. 10. Cancellations and postal history. I will spend the remainder of this post exploring and discussing each of these aspects. 1. Printings made during the Edward VII period, from 1906 until late 1911. 2. Wet printings made during the Admiral period from 1911 to late 1922. 3. Dry printings made during the Admiral period from 1922 to 1930. The stamp on the left is deep lilac, while the stamp on the right is deep rose-lilac. The stamp on the left is light plum, while the one in the centre is plum. The stamp on the right is deep plum. The stamp on the left is light blackish purple, while the stamp in the centre is deep reddish lilac. This is very similar to the deep rose lilac shown on the 5c above, but is not quite the same. The stamp on the right is blackish purple. All of these are dry printings, yet you can see very clearly, hopefully, that the colours of the stamps on the left and right are the same basic colour, which it totally different from the stamp in the centre. The stamp shown on the left is plum, while the stamp in the centre is light plum. The stamp on the right is deep plum. This stamp is deep purple. The above represents a small cross section of the shades that exist. I would emphasize that there most likely are many more shades than I show here. However, I have illustrated all that I have seen with the material that I have handled. However, it would definitely be a worthy endeavour to attempt to study the shades in depth. This can be done relatively inexpensively by looking for accumulations of pen, pencil, or crayon cancelled used stamps, or uncancelled used stamps. These tend to sell for much, much less than the Unitrade prices for used. 1. The paper of the Edward VII period starts off creamy in colour, with very little visible mesh, and a gum that is yellowish, has the appearance of being sponged on, and a satin sheen. Later, the paper becomes toned yellowish and later it goes back to being white, with mesh that is quite visible and coarse. The gum continues to be yellowish, with a sheen that is a bit shinier, but by no means glossy. 2. The paper of the Admiral period starts off with coarse, visible mesh and yellowish gum with a satin sheen. The gum becomes less yellowish and more cream, while acquiring a more glossy sheen. The mesh becomes finer, until it completely disappears with the dry printings. The gum on the dry printings, goes back to having a satin sheen, but being less yellowish than the early Edward VII gum. I should point out that so far all of the stamps I have seen from this issue are printed on horizontal wove paper. However, that is not to suggest that there are not any examples on vertical wove paper. An example of an Edward VII-era printing on toned wove paper, with barely visible horizontal mesh. Another example of a Edward VII-era printing on a creamy wove paper. A final example of an Edward VII-era stamp with deeper yellow gum. A example of a mid-Admiral period wet printing. A late wet printing on the so called "thin paper". The easiest way to identify this is by the very obvious and very coarse mesh. In actual fact, as I discuss in my posts on the Admiral issue, there is very little actual difference between the measured thickness of this paper, and the regular wove paper. An example of a typical dry printing showing the creamier gum, and clear design embossing that is characteristic of the dry printings. From 1906 until late 1922, the stamps of this issue were printed on dampened paper that shrunk across the grain and after it was dry, the gum was applied. As I have pointed out above, all the stamps I have seen were printed on horizontal wove paper. This means that wet printings would shrink from top to bottom, so that the dry printings will be generally 1/2 mm taller than the wet printings. This will generally be the only way to distinguish the wet from dry printings on the used stamps, for those who are not comfortable relying on differences in shade as shown above. For the mint stamps, the easiest way, I find to identify the dry printings is to look for embossing of the design on the back of the stamp through the gum. I have not yet come across a dry printing that did not clearly show this embossing effect. The reason why this embossing arises is because pre-gummed paper was used for printing. As printing took place, it was forced into contact with the printing plate under pressure, which produced the embossing that you see in the scan above. All five values exist as dry printings, with the 4c and 10c only existing as dry printings. The 1c, 2c and 5c exist both wet and dry. The so called "reddish violet" "c" numbers in Unitrade actually refer more to any dry printing than they do to the actual shade in my humble opinion. The used block on the left shows the type A lathework in the left hand margin, while the stamp on the right shows the lathework in the left margin. If you scroll through to about half way to the bottom of the post, you will come across the headings that deal with the lathework on the Admiral issue. The upshot basically, is that the lathework design used, depends on when the stamp was printed, with the earliest one being in 1917 (type A), and the last one being type D, which was in use from 1920 to 1924. One implication to the above, is that the 4c and 10c should definitely not exist with lathework because they were not issued until long after lathework was abandoned. However, the 1c and 5c should definitely exist with lathework. It may simply not have been discovered or reported yet, given that the print quantities of the 1c and 2c values were 25-30% of what the 2c stamps were. In any event, all the lathework on this issue is very rare, and it is quite possible that used examples could be lurking in bulk used lots and their sigificance not apparent to those who are unfamiliar with what it is. 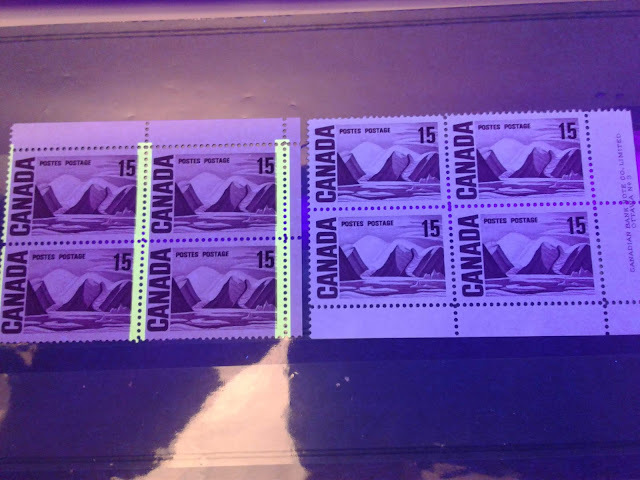 The 1c, 2c and 5c all exist in imperforate pairs, without gum as issued. They are all very rare, with only 100 known pairs in each case. Despite this, their prices in Unitrade are ridiculously low, listing for between $350-$500 in each case, depending on whether they are fine or very fine. 1. Re-entries do not exist on these issues because the plates used to print the stamps did not need to be re-entered, either because too few stamps were printed, or because the plates were replaced as they wore rather than being re-furbished. While this is plausible in the case of the 10c, where only 1,000,000 stamps were printed on nickel-chromium plated plates, it does not seem likely in the case of the other values, where the print quantities were all over 13 million. This is more than enough stamps to cause a plate to wear to the point that a re-entry is required. 2. Re-entries do exist, but have simply not been discovered yet, due to the fact that finding them usually requires the study of many hundreds or thousands of stamps, and acculuations that large do not generally exist for this issue, or if they do, I haven't seen them on the market. 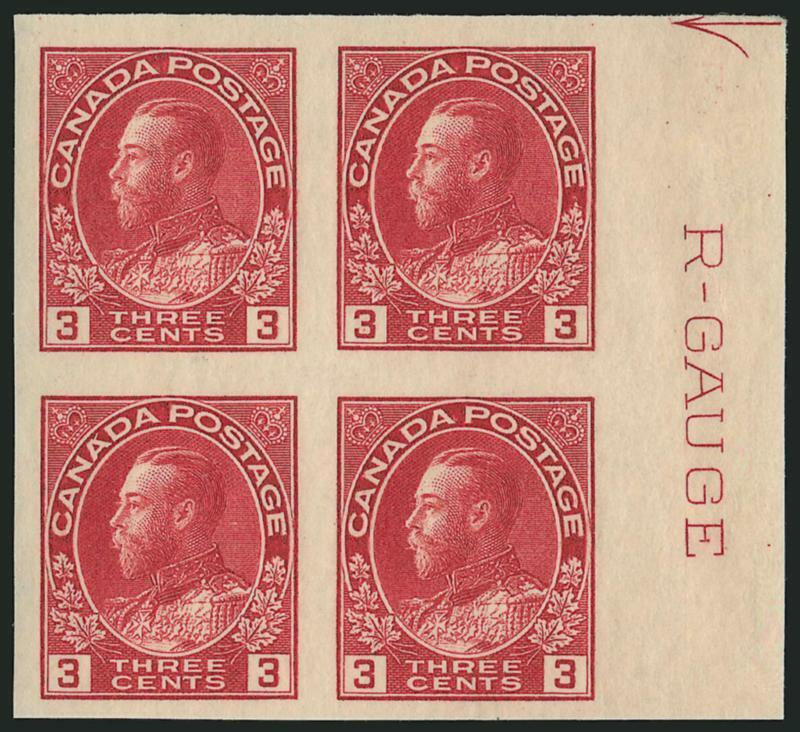 I don't have an image for the R-Gauge imprint on this issue, but it looks more or less like the one shown on the 3c Admiral imperforate block above. Both of these are quite scarce listing in Unitrade for $350-$500 each. Curiously enough, they are not known on either the 1c or 2c values, even though they should exist, at least in theory. 1. One large trial colour proof of each value on card in black, of which there are only 3 of each known and all of which are valued at approximately $2,000 each. 2. One stamp sized die proof of each value on card in black. Again, there are only 3 known of each, and these are generally valued at $1,000 each. 3. One large hardened die proof of the 4c & 10c values in the issued colour. Again there are only 3 of each known and all of which are valued at approximately $2,000 each. 4. One large die proof of each of the 4c & 10c values in the issued colour. Again there are only 3 of each known and all of which are valued at approximately $2,000 each. These are both initialed JPV and dated "6 June 28". So at these prices, the proof material represents a challenge, but a manageable one, as you can likely acquire a complete set of all items, with patience, for less than $40,000 over a collecting lifetime. The 1c was used on local city letters that were redirected to an address outside the city. 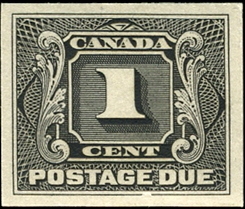 The 2c was used on shortpaid first class letters or postcards, where the deficiency in postage was 1c. So before 1926, this will be on items bearing only 2c postage or incoming short-paid postcards from foreign countries. The 4c value would have been used on local unpaid mail where the deficiency in postage was 2c. So that would generally have been letters within the first weight step or postcards that bore no stamp at all. I have never seen covers bearing the 5c or 10c values, even though they most likely do exist where special delivery covers or registered covers were shortpaid. The rate for registration remained at 10c throughout the period of this issue, so we would expect short-paid covers to be quite rare, as the general public would have been well aware that the rate for this service is 10c. The special delivery rate however, did double in 1922, from 10c to 20c. So I would expect that there would have been several instances in 1922 when people attached a 10c stamp, when a 20c stamp was required. In these instances, the 10c deficiency would be rated as 20c. This could then be covered with a block of 4 of the 5c value, or a pair of the 10c. Most of the stamps of this issue were either not cancelled, or were pen, pencil or crayon cancelled. So one very rewarding challenge would be to collect these stamps either as singles or multiples with CDS town cancellations or split rings. There are tens of thousands of different post offices across the country, but I highly doubt that it is possible to find an example of every post office on even 1 stamp from the 5 in this issue. However, it would be a lot of fun, and not very expensive to try. This concludes my review of this issue. My next post will look at the Third Postage Due issue, which was in use from 1933-1935. We have a nice selection of mostly mint stamps from this issue. Should you wish to view them, you can do so by accessing the following link and navigating between pages 2 and 4.